In his essay on the history of photography Walter Benjamin charges patent-law problems and a coincidence of industrious inventors as the cause for the accelerated development and misty history of the medium. Conditions were created ‘that for a long time ruled out any kind of looking back.’ (1) The irony is that photography created the conditions for a backwards-look, an arrest and exposure of the momentary that made looking back, both pastime and pleasure. What was it now possible to look back at? Nothing more than the optical unconscious. This was Benjamin’s term for the hitherto unseen, the blown up, the magnified, the halted and the reversed. After photography people could see, for the first time, ‘their posture in the split second of their stepping out’. It is its revelation of the split second that makes the camera a time machine. Obsession with the split second is not a new phenomenon as the 26 works on show here, spanning 1896 – 2014, make clear. Film, video and still-image animation make up the largest proportion of an exhibition that includes drawings, sculpture, musical scores and recordings. From the grainy magic of Georges Méliès and Louis Lumière to Teching Hsieh’s 8,627 single film frames depicting a year of clock-punching, the screen-based medium seems to be the one that is turned to and returned to for attention to the timely. The show’s curator, Maquard Smith, set himself this question, ‘what is particular – historically, conceptually, aesthetically – to the recent temporal turn in contemporary art?’ He writes that each work ‘makes it possible to play around with, to transform and reinvent the ordering of the past, the present and the future’. What the works do side-by-side is in fact to reveal the opposite, they might desire to subvert and escape time but not a single one does. The medium of photography and film is satisfying because it can be manipulated; it permits the fantasy of slowing down, speeding up and holding still. The art historian Carol Mavor has described her essay on nostology (the study of aging) as ‘an embarrassment of helplessness’. This exhibition reveals the construction of time machines to be a similar endeavor. The machines betray a discomforting obsession. Their makers are desperate, compulsive, and I suspect, always to be frustrated. On Kawara’s date paintings are only a more legible version of the lines scored into prison walls, made by a captive so as not to forget. But not to forget what? Are dates so important? Are times? As Martin John Callanan’s ‘real time’ departure board, for all the planes in the world, scrolls through an improbable spew of lift offs from Ho Chi Minh City, from Bradford, from Tibilisi, the effect is nonsensical. These events (flight, waking, falling asleep) are both countable and uncountable, or, counting them does not add up to an amount that contains or stands for what is ‘real’. An attention to time does not hold it still, nor does it empty it of its contents. Which is not to say that this is a pessimistic exhibition. Although redolent of Samuel Beckett’s gallows humour, a lot of the works are extremely funny. After all, a good joke is all in the timing. 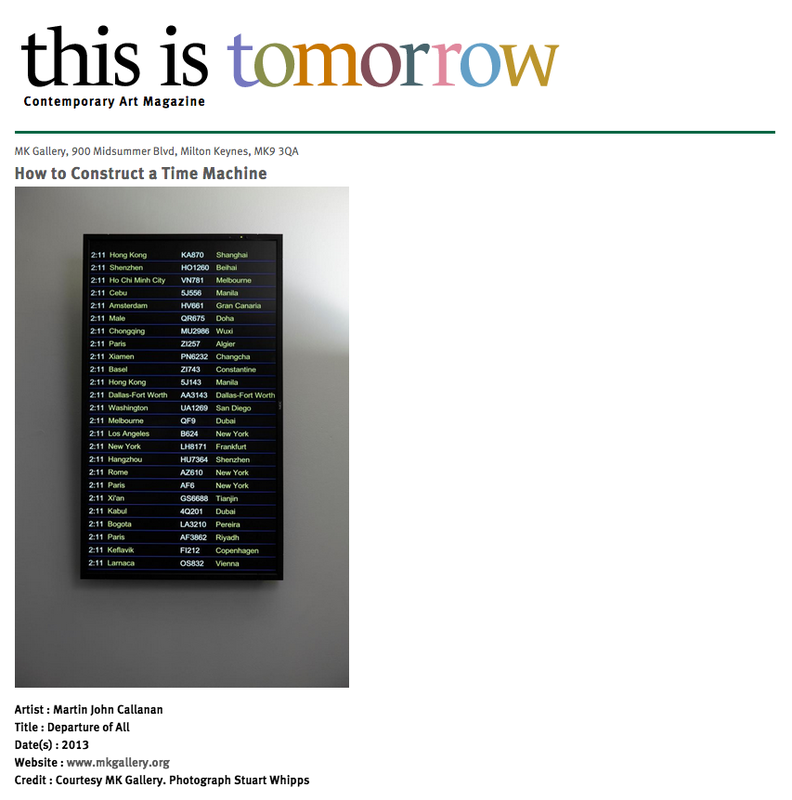 Thomson & Craighead’s ‘The Time Machine in Alphabetical Order’ calls out ‘machine, machine, machine, man, man, man, Morlocks!’ A number of the pieces give glimpses of a technological unconsciousness, the unbidden pictures and patterns that emerge from automatic systems of ordering. Manfred Mohr’s programmed expressionism uses algorithms to make art. The humour of these pieces works side-by-side with the discomforting sensation of the inanimate made animate. It is always funny (and tragic) to think about what is happening at the same time as something else. Upstairs from the exhibition, in an empty Video Room, I watch John Cage and Merce Cunningham dance and make sounds on the same stage. Purposely near to one another but conscientiously dislocated they try to make their work without influence from the other. Cage describes it as ‘two things going on at the same time, which is characteristic of life’. It is the ‘at the same time’ which is the most contemporary of concerns for the time machines whirring in the gallery below. Current technologies make simultaneity visible, splitting seconds and distributing their image. The desperate work of the self-consciously timed machines continues – and the clocks still work.